The multi-city tour features visual works of art from nationally renowned artists, Frank Morrison, Aniekan Udofia, and AB+L’s very own curator, Dubelyoo. From a music perspective, each event features live performances from hip-hop notables. To top off the experience, complimentary Jack Daniel’s Tennessee Honey cocktails are served to guests throughout the evening. Part art gallery, part day party, walking into Echostage that day was an experience like none other. Hip-hop and art lovers flocked to the event which boasted over 4,000+ RSVPs before they closed the list. The event's curator, Dubelyoo, hand-picked each piece that ranged from the subtle to the contrasting. Guest were able to see each piece up close while sipping on the specialty cocktail of the night, The Sweet Graffiti (which was delicious, by the way). Each artist was personally selected to display their pieces, and most of the pieces on display were created in an artists’ warehouse under seemingly grueling conditioned. The idea behind it was to ensure that the artist had the drive and creativity to push past their environment: an existential example that can apply to almost anyone that is creative or has a passion in life. In addition, the artist were required to decorate their gallery wall as opposed to the typical white background which ultimately made for an interesting and exciting touch. With DJ sets by Wally Sparks, DJ Cuzzin B and Jeremy Avalon, the vibe was set in a major way. With a headlining set by one-half of the Big Tymers and the Cash Money label, Mannie Fresh made sure we hip-hop heads were satisfied, with or without the "Gator Boots". 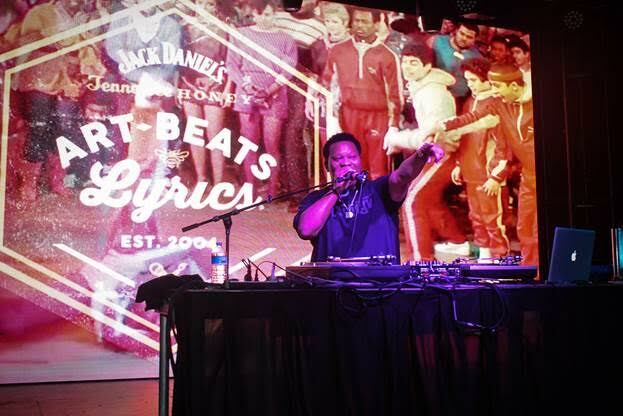 Legendary hip-hop producer and DJ, Mannie Fresh, shows off his skills on the one’s and two’s at the Art, Beats and Lyrics event in Washington D.C. Presented by Jack Daniel’s Tennessee Honey, Art Beats and Lyrics showcases some of today’s best upcoming artists, along with seasoned veterans in art and music under one roof. For information on Art, Beats and Lyrics please visit www.JackHoneyABL.com. Check out the full photo gallery below. The multi-city tour is currently on the road. AB+L has stops planned in Chicago, St. Louis, Miami and Houston. Head to www.JackHoneyABL.comto get more information on the tour and to RSVP for their next events. Thank you for bringing such a different and immersive experience to the DMV. Looking forward to the next time.